Locally owned, operated, and grown, Horseshoe Point Honey LLC is a small, sustainable, beekeeping operation in the North East section of Suffolk, VA. Dedicated to raising bees in a natural & healthy way, we offer 100% pure raw honey—just how the bees made it. Never heated or processed, no chemicals used, and only gently screened so that the natural pollen is maintained to aid allergy sufferers. Unlike ‘store bought’ honey, which is normally heated (pasteurized) and ultra-fine filtered, our honey is unprocessed, raw, and naturally healthy. Many allergy sufferers attest that consuming local honey reduces their seasonal allergies because of the small amounts of local pollen maintained in the honey. Unprocessed honey also contains small amounts of a wide array of vitamins, minerals & amino acids, plus antioxidants. Honey is nature’s energy booster, providing a concentrated energy source that helps prevent fatigue. Also, latest research proves that honey is a better remedy than any over-the-counter cold remedies for sore throats and coughs. There’s an important difference between what you get at the supermarket and what you get from a trusted, local beekeeper. 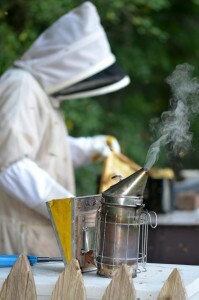 When honey is processed commercially, it is often finely filtered and heated. Fil tering removes most pollen particles and the heat can change the color, taste and, most importantly, destroys the vitamins and most of the natural health benefits. 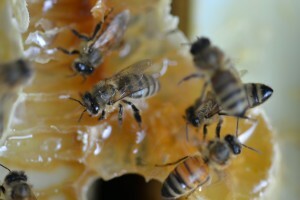 Additives have also been discovered in commercially processed honey. Local honey taken for allergy relief is defined as within a 50 mile radius of your location because vegetation and, thus pollens, do not vary much within 50 miles. 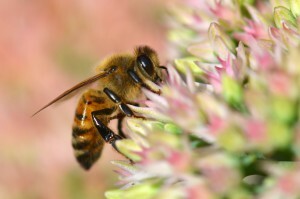 Local honey contains the same offending pollens that seasonal allergy sufferers need to address. We use the coarsest mesh filters possible when straining the honey to ensure the beneficial pollen is retained in the honey. 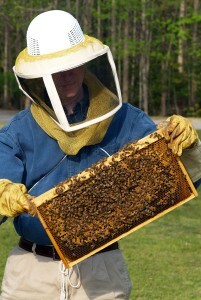 All of the Hampton Roads Area of Virginia is within 50 miles of our bee hives. Norfolk is only 15 mile s away. Horseshoe Point Honey LLC is state certified by the VA. Dept. of Agriculture to process (extract and bottle) our honey. We use no chemicals or pesticides and are careful to ensure our bees are not exposed to pesticides. Horseshoe Point stands behind its honey and believes you will classify it among the best honey you can find.